Henry Wadsworth Longfellow had endured several tragic years. First his wife died in a freak accident then his son was severely wounded in the Civil War. 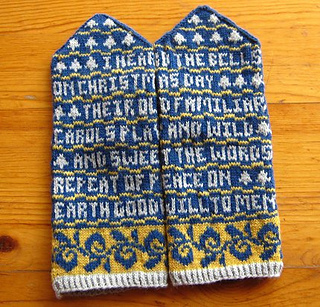 He wrote his poem of hope Christmas Bells on Christmas Day 1864. Size small (7 1/2”/19 cm circumference) uses size 0 (US) dpns and gets a gauge of 44 sts and rows to 4 inches. Size medium (8”/2 cm circumference) uses size 1 (US) dpns and gets a gauge of 40 sts and rows to 4”. Size large (8 1/2”/21.5 cm circumference) uses size 1.5 (US) dpns and gets a gauge of 36 sts and rows to 4”. 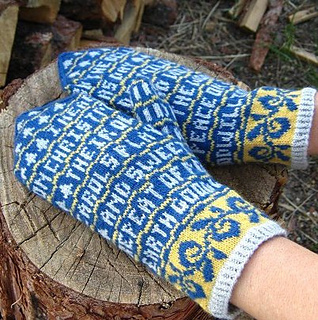 These mittens use 3 colors of Knit Picks Palette - the blue pair shown use Mist, Semolina, and Delta and the second pair use Ivy, Pimiento, and White. 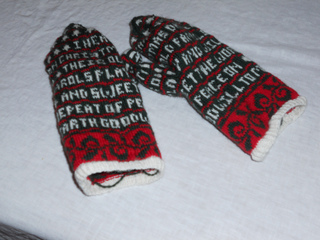 The pattern includes charts for both color combinations. 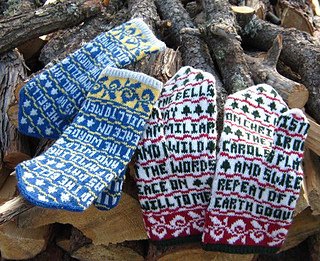 The I Heard the Bells Mittens are knit from cuff to tip and feature an easy peasant thumb and a short twisted rib cuff.